We woke up to clear sky’s and great view of the mountains! After breakfast at our campsite, and catching up on some emails, we caught the train to Chamonix. 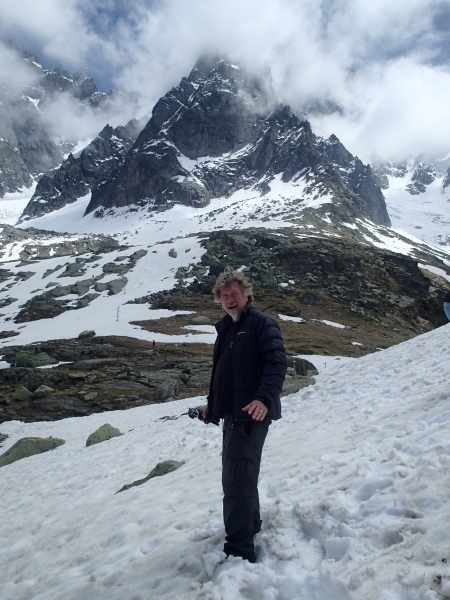 We then walked to Aigulle Du Midi where we parted with 57 Euros each to get the cable car to the top of the Mountain. We soared over forests below to reach the Plan de L’Aiguille at 2317m where we had to change cable cars mid way. From here you could see the Bosson Glacier, Mont- Blanc, Aigulle Verte, the Drus and the Aiguilles de Chamonix. Here we saw several paragliders launching off into the void ….amazing! In 10 min the second cable car took us to 3777m above the seracs and glaciers. Unfortunately, the lift that takes you to the peak at 3842m and “the Void” was out of action…..it won’t be fixed until July…..considering this is the 60th Anniversary year for them it was a bit disappointing. We spent around an hour and half at the top station moving between the various lookouts. The view was breathtaking and for Vince at least somewhat Vertigo inducing. I felt quite light headed and needed to sit down for a while to adjust to the high altitude. We could see climbers out on the snow…some carrying skis on their backs. From some vantage points we could look down towards Chamonix and we could see planes and helicopters flying far below us. The clouds closed in a little obscuring Mont Blanc but we had the most fantasising view of the Bossons Glacier….the tongue looked like we could just reach out an touch it! The past two evenings as we have been in out tent we have heard the crack and thundering roar of Avalanche as small parts of the glacier have broken away. Today we saw fissures on the mountain that are just avalanches waiting to happen! I took the opportunity to throw a snowball off the mountain but Vince was a big girls blouse and refused to do so….siting OHS regulations! Further more he didn’t want to spark the next Avalanche…..needless to say no one was harmed and no Avalanche occurred. We stopped in at the cafe for lunch and the Mer De Glacé cafe must have pre warned them that the suckers were coming….because this time we paid even more for our toasted ham and cheese sandwiches (ham on the inside, cheese in the outside and toasted just on the top ….very unique!). We paid 23.50 Euro and Vince’s left kidney! Neither of us were feeling 100 per cent so we descended to Plan de L’Aiguille where we exited onto the actual mountain itself, no barriers, no steps, just nature in the raw! Loving snow as I do I could not resist clumping across it….however, this was not without it surprises! …..My left leg disappeared suddenly and I found myself stuck in thesnow…..my husband, rather than assist or rescue me….reached for the Go Pro and Camera! After I freed myself, I continued and the same thing happened to my right leg…this time even deeper so I found myself sitting on the snow! Two wet feet and a wet bum….what more could a girl want? That said…it was well worth any effort….the views were spectacular no exhilarating! After enjoying the magnificently views we caught the lower cable car that took us down the bottom section of the mountain back to Chamonix. Despite the sensations of altitude sickness it had been a truly exhilarating experience which had prompted Vince to start talking about taking up mountain climbing as a hobby ……help me!!!!!!!!! We walked into the town of Chamonix, Vince picked up a spare fuel bottle for the Dragonfly. Currently our small bottle only contains enough petrol for 6 meals (3 days) before it needs to be refilled….we will benefit for the larger one. It was quite hot in town so we had an ice cream each to cool down. Out hunt for a camping frypan remains unsuccessful and in addition we found all supermarkets closed on Sunday….luckily we have a “tin surprise” form Germany left over ….that we think is chicken but may be fish….we’ll find out! It rained all night and we woke up with water dripping on us….but not too much of a drama! We made ourselves some breakfast and set off for Chamonix. We were thinking of going up the mountain to Aiguille du Midi…but there was a lot of low cloud cover so little point as we would not have been able to have the best view, so we decided to go to Mer De Glace instead. The bus and train don’t run very often so we started walking ….about 3km….45min before we caught a bus. We arrived in Plac de La Mon Blonc and walked to the funicular train station for Montenvers. Tickets were 30.50 Euro each and we only had about 5 min before departure. The train cugged up the steep track thought the forest and took 20 min to arrive at its destination. Originally built in 1907 the train is an engineering masterpiece. From the train station at Montenvers, you then take a gondola half way down the mountain side towards the glacier face before descending the rest of the way on foot, via a steep and winding staircase. The glacier has been tunnelled in a loop and is lit up inside with multicoloured lights. Small alcoves off the loop contain ice sculptures and photographs of the early pioneers who opened up the glacier. Returning via steps and gondola to the train station above we then got ripped off at the cafe there, paying 17.50 Euro for two toasted ham and cheese sandwiches and one diet coke! We walked up to the Temple of Nature with an impressive view, then down to the Glaciorium and enjoyed the audio visual displays there. Rejoining the funicular train we travelled back down the mountain side returning to ritzy Chamonix. 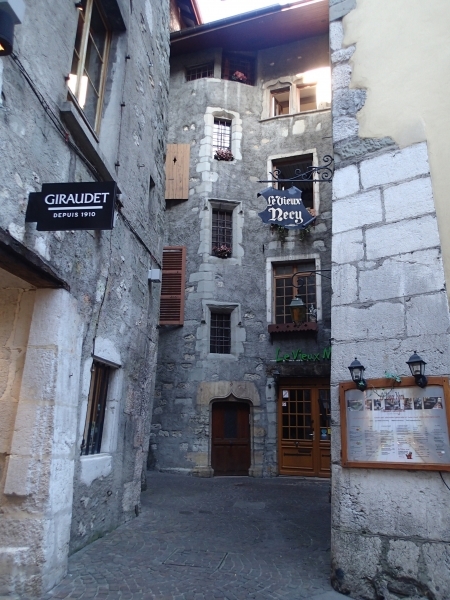 Despite the appeal of staying another night at the Ace Hotel in Seynod, just out of Annecy (comfy bed and nice breakfasts) Friday was time to move on. Karen had plotted a scenic route from Annecy to Chamonix via the D1508, so I snuck the bike out of the secure underground garage (parking was five euros/night but only if you told them you were using it) and then I parked the bike near our open window so Karen could pass the gear bags out to me as I waited below, a bit like Ruppunzel just different. Loaded up we scooted around the corner to get some fuel and had a trying time at the garage with an impatient car driver edging closer and closer to the bike – at this servo you fuel up then get back in your car and then pay at a little booth you must exit past. Anyway got out of there and then got routed by the GPS through some of old Annecy before we picked up the D1508 and started making our way through the valleys towards Chamonix. At Ugine the road we wanted had disappeared underneath a load of construction vehicles but just as we were trying to figure out an alternate route a man jumped out of a truck with a big road sign pointing to a deviation, so we followed that cue and were soon heading up into the alps, following a series of switchbacks and twisty roads as we made our way through the sunshine. We just took the riding easy today as I was still a bit clogged up with a head cold and not feeling 100%, and these roads demanded your full attention in some places. We eventually picked up a motorway for the last leg into Chamonix after descending a very twisty hill with an impatient car stuck on our rear bumper – I usually pull over and let faster traffic through but on this twisty section there was nowhere safe to pull over and I was doing the speed limit anyway …. I think a lot of French drivers fancy themselves as the next Alain Prost. We stopped for lunch in Chamonix – note – don’t sit at a table for four if you’re only a couple as you’ll be reseated quicksmart, even if there are no other potential customers around. After a lacklustre omelette each we remounted and headed a few km’s out of town to our campsite. The campsite we intended to go to was closed, so we went with option 2 at Des Ecureuils at the foot of Bosson Glacier. The office was closed until 4.00pm (2 hrs away) so we cheekily checked out the sites, picked one and set up camp with a magnificent view of Aiguille De Merdi, The Bosson Glacier and Mt Blonc ….fantastic! We sorted things out when the office opened but unfortunately got incorrect directions to the supermarket and ended up walking about 3km in the wrong direction before turning back. We then walked another 2km to eventually find it. We got a few supplies for dinner and breakfast and headed back to camp. Dinner was ravioli out of a tin, warmed up using our trusty dragon fly stove. After watching the light from the setting sun illuminate the Bossons Glacier, the myriad of colours, it was time for bed. After breakfast ….we organised the front desk, at the Ace Hotel, to print out the documents we needed for our India Visa Applications. We headed off to Geneva (Switzerland) 40km away, and paid 3.80 Euro ($6.00) in toll to drive less than 6 km of motorway! Same on the return trip! 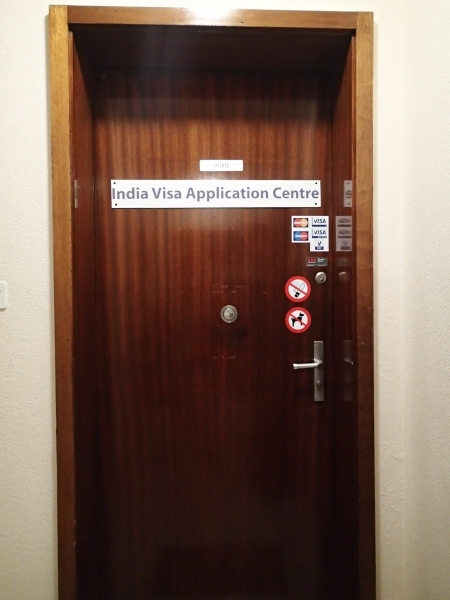 After negotiating our way through traffic in Geneva, avoiding the trams and riding down what we now think was a pedestrian mall, we arrived at the address for the India Visa Application Centre. We eventually figured out how to use the secret squirrel intercom system and got them to unlock the door. We proceeded up the dingy steps to the first floor and entered the offices. We were greeted by a young woman, who spoke English, but who was more interested in discussing her personal life on the telephone than actually being of any assistance. She only gave us the parroted information we could already access on the internet ourselves! She kept rabbiting on about Visas on Arrival and we tired multiple times to explain we were not arriving by plane, but riding our motorbike and we would be at a boarder crossing without any vista and our Pakistan Visa would have run out….so effectively we would be stuck in No Mans Land….. She eventually contacted someone in the India Consulate in Geneva by phone and he was no more helpful. The best suggestion they could offer is that we apply in Islamabad (Pakistan) ….not our idea of fun and not practical! A little disheartened from the experience we pushed on to BMW ( Vince has been trying to organise a service and tyres for days with little luck as everywhere is booked out). When we eventually found the place it was 12.15pm and they close at 12.00pm until 13.30! Not our day today! So we found a nearby place (the Merena Bar) to sit in the shade and have a drink while we waited! Once BMW opened we discovered they too could not fit us in for another 3 weeks….so we will got with plan B, move on to Switzerland and eventually get the service and tyres done in Austria in a few weeks time! We had tolls again today…always my favourites …NOT! But I am now using the credit card rather than coins and that makes it easier…in fact I didn’t even need to get off the bike today! I worked it out and now we are back in France at our hotel we have crossed 13 borders so far….check the new page out under the Our Route Tab. 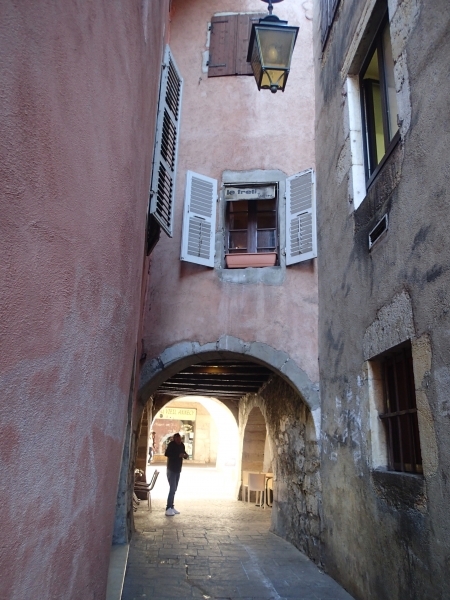 On the way home we stopped in at the “Old Town” in Annecy….the buildings reminded me of Venice. They were so close together that it sent the GPS into a spin and Vince ended up in a one way street ….going the wrong way! The locals alerted us but we could not turn around in the narrow street so just had to keep going until it widened….scary! We went back there in the evening for dinner and it was magical….so romantic and beautiful. I gave a homeless person, with two dogs, some money and later I sneaked a pic of him but his freaky friend saw me and went off her tree ….luckily I can’t speak or understand French…the man concerned spoke up to her and said it was ok…so she eventually went away, but it rattled me a bit…guess that’s the risk you take when you take spy shots! We went for s walk around the lake after dinner, and we met a German lady, Marlese, with her little dog, Speedy. A six year old English Terrier who had not been so speedy that morning and was showing his battle scars from a dog who attacked him. We had a bit of a pat which provided us with a fur fix….as we miss Cebar…our own dog back in Australia. After the long ride yesterday from Paris to Annecy, and a restless nights sleep, we decided to abandon our initial plans to ride to Chamonix and Geneva, and just have a relaxing Off Bike day. Vince took the opportunity to prepare our India Visa Applications and endeavoured to contact numerous BMW dealers in France, Austria and Switzerland to get our bike its 20,000km service (we’ve done 9000 on this trip so far) and new tyres….whilst I plotted a scenic route though the alps in more detail for when we can move on. We took a walk to some nearby shops looking for a few extra dry bags (because the panniers leak and we are using plastic bags they now have a few holes in them….no luck! In the evening we had a “cheap and cheerful” dinner and did a bit of online banking…..OMG have we spent that much already! Freedom doesn’t come cheap! In the morning we said good by to John Paul, a BMW rider, who on this trip had brought his push bike from Switzerland on the train all the way to Paris and was about to embark on his second ride to Camino de Santiago (Way of St James). As he cycled away Vince noticed a sea shell tied to his pannier, the symbol of the pilgrim on the way to St James. We packed up the tent and were on the road by 10.00am. It was a 5 hour ride down the A6 motorway that took us to Annecy. There were various toll boths (totalling around 35 Euro)…although I still find them stressful and frustrating at least I didn’t get my head almost flattened this time. At one refusing stop we met a middle aged gentleman,and anesthetist, Jeff Grayn, who was very interested to hear about our adventure and is contemplating one of his own….maybe to South Africa. I encouraged him to set a date and tell someone about it…..then life can be breathed into the dream turning it into a reality. Th Ace Hotel is a new property, only opening last Dec, but Alex, the Manager and his staff made us very welcome. It is quite cheap for France at 55 Euro for the room and breakfast is 6.50 Euro each…..so not too bad….as we have to watch our penny’s! It’s costing us much more than we anticipated just for the basics! We had an expensive and unremarkable breakfast at the hotel in Reims….we decided to forgo our idea of doing a champagne tour and head on the 180km ride straight to Paris. I had been expecting the area of Champagne in France to resemble something like the Swan Valley or Margaret River, but from what we saw it was nothing like it….disappointing! We found the camping ground Le Beau Village in Villiers-sur-Orge, not far from Sainte-Genevieve-des-Bois. The office was closed when we arrived at lunch time and didn’t open again until 3. We managed to squeeze the bike through a side gate and waited. We met an English rider, John, and he and Vince chatted a while. I met a German couple and chatted with them. All were very interested in our trip and shared their own travels with us. The pitch was right near the bar and toilet area (you have to supply your own toilet paper here!) and was fully exposed with no trees or shade…at a cost of 20 Euro per night without power but it was all there was. Once we set up we took a train to Paris…only to discover the line was closed further down and the train returned to where we started! We got off one stop early and swapped platforms and found we had to change trains further down ….but we got there in the end after about an hour and a half. We got off and had a bit of trouble trying to get out of the underground shopping area…when we eventually surfaced like little Moles…we had no real idea where we were. We tried to get some dinner at a nearby restaurant but they said the kitchen was closed …it was still daylight and only 7.00pm ….what is it with us and food?…seems we can never find any! We went back to the underground shops and had some takeaway food there before getting back on the trains to repeat the comedy performance return trip. We had a noisy night with the bar patrons carrying on until at least 1.00am! We met a German couple who had been in Paris for the Citroen 60th Celebration…..there were lots of them under the Eiffel Tower! 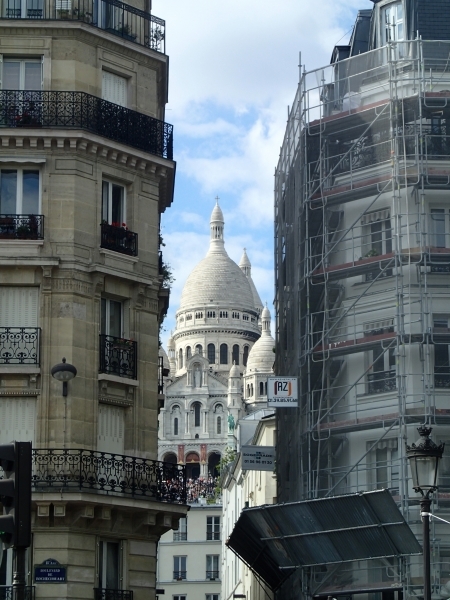 Our second day went similar to the first in terms of catching the train but this time we changed in Paris to the Metro and we got to the Plas de la Concord – where there were many Citroen’s including the new release. From there we walked to the Eiffel Tower because the line going there was closed for work. The map was very deceptive and it was quite a long way before we got there (about an hour and a half). We got some food from the street stalls and I had a very long wait for service for my crepe, Vince had finished his meal before I could even order mine as the guy serving was hopeless…it was like watching Manuel from Faulty Towers! We intended to climb the stairs for a Champagne at the top…but the line for tickets was unbelievable….so we decided to forget that idea. We then caught the metro to Notre Dame and walked along the Sein to the bridge with all the locks but it was falling down, completely full and boarded up! I was disappointed as I had promised myself next time I came to Paris I would not be on my own and I would put a lock on that bridge. We continued walking to the next wire bridge, near the Musee de Orsay (my favourite!) and they had started putting locs there, so we picked out a spot, from the Louvre side, between 12 and 13 posts along, towards the middle, 2nd row down facing the Musee de Orsay….! Perfect….everything happens for a reason! The lock from our wedding is now there, engraved with our details and we through the key with our surname engraved into the Sein! Mission accomplished…..my Husband has a solution for everything! We got back on the Metro to Madeline where we intended to get some food from Fuchon, but it was closed! We ended up in a lovely sidewalk cafe for a meal….Vince had a Beer and I had a Champagne….a very romantic off bike day! What a Honeymoon! We made our way back home on the train and again were kept awake by the revellers at the Bar….this time we joined them for a bit. Ruddy, and elderly Frenchman got out his violin and was playing for his supper, someone else started on the mouth organ and a Frenchwoman got me up to dance with her….all good fun! We chatted with another tenter, who was Dutch, he had come with the Citroen thing….everyone is interested in our journey and they all admire our bike. Our final day in Paris was a late start with the usual train changing fun and caught the metro to Galleries La Fayette were I got a padlock charm for my bracelet and we had some lunch. We then went sight seeing, but this time we saved our poor feet and took the Hop On Hop Off bus tour of Paris….at Madeline Fuchon was still closed and the smaller one was open but corded off – the guy at the desk had not interest whatsoever in serving us. We finished up in Monmarte and walked to Guard De Nord station, stopping in a nearby cafe (Chinese) for dinner before catching the train home. Kept awake yet again by the revellers at the bar until well after 1.30pm!!! Lesson….when agreeing to a tent pitch check out the shade situation and the entertainment areas…..if you want to get some sleep! After breaking camp from Cernay, we refilled the bike and retraced the Route de Crete….another amazing ride! The riding conditions were even better than yesterday and we had a fantastic time following it to its end this time at Saint Marie Aux Mines. Here we left the mountains and made our way to Reims via the mind numbing motorways for a total of 6 hours covering 470km. The first 112km took us about 2 and a half hours. We encountered some toll roads. 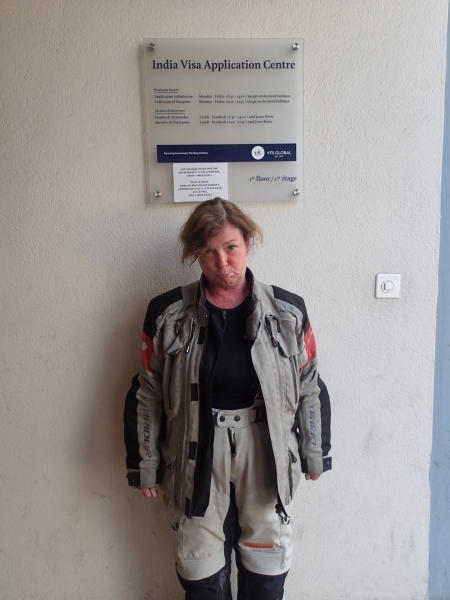 The first was relatively simple (5.60 Euro), other than Vince going into the NO MOTORBIKES ALLOWED lane, because he saw a picture of a motorbike with a red circle around it, the next time I almost lost my head….literally! Each time I had to get off the bike and feed the machine with coins, when I did it for the second time (8.50 Euro) I left my gloves on my seat and as Vince took off when the barrier opened they flew off backwards onto the road. I had moved out of the way of the oncoming traffic and was planning to catch him up when I could cross the multiple lanes of cars (these toll booths are NOT designed for foot passengers!) when a driver alerted me about my gloves. I went back and saw them being run over by a large truck. I went to the next truck, which also ran over them, and the driver saw me pass and I went to the rear to try to retrieve them. I indicated to the lady driver in the next car that I needed to get my gloves. I proceeded to get the first one from just underneath one of the tyres and then leaned in to get the next one but my hemet stopped me…so I went lower to get under the truck and get my glove and the wheel in front of me started to move ….which of course meant the one behind it was coming towards me….the lady in the car behind sounded her horn to warn me….but I was already onto it and got out of there quick smart! I then still had the multiple lanes of traffic to deal with before getting back to Vince, who had pulled over in a slip lane and was waiting patiently and totally unaware that he almost had a flattened wife! I don’t like toll roads! Having survived the truck incident we made our way through peak hour traffic in Reims from one end to the other to locate our dingy but cheap (49 Euro) hotel. At least we can now charge our electrical devices (everything is flat – we had no cameras today!) and dry out the tent! We deserved our beer and glass of champagne with dinner tonight! The waitress did everything she could to discourage our dining at the restaurant but we ignored her and were punished as a result! I don’t think she could have picked fattier cows to choose our steaks from if she tried! Weather much better today for our ride. We picked up the start of the Route de Crete, just north of Cernay, and followed this twisty mountain road as it climbed up to its peak of 1325m at the Grand Ballon. The road was quite steep in sections and had many hairpin bends. Some of these were paved with cobble stones and demanded Vince’s full attention. This road was a military supply line in WWI and provided us with breathtaking views of the valleys below and the distant mountains. We took a deviation and headed down to Gerardmer, and stopped for lunch in this quaint little village. We had crepes for lunch and a group of teenage boys approached us and chatted. Only one spoke English but he enthusiastically translated our answers to many questions, to his eager companions. We headed east towards Munster, along the D417 and had a blistering ride! In Munster we stopped for coffee in the village square and chatted with 3 German riders who were keen to offer riding route advice. From Munster we retraced our path back along the Route de Crete and headed South back towards Cernay, stopping to pay our respects at the Hartmannwillerskopf Memorial for French Soldier who died in WWI. Just under 1300 were buried in the Cemetery and 12,000 unknown soldier are interned in the crypts of the memorial. We intend to go for a ride along the 417 and the 430/431 (Route de Cretes) but it rained all night and the bad weather continued. 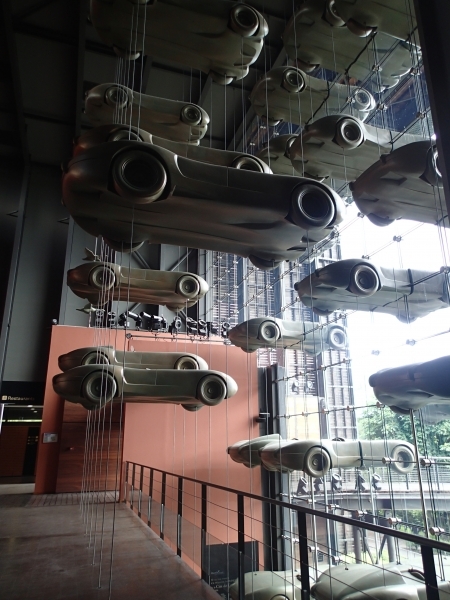 After dropping off some washing at the laundry (a bit of a mission to follow local directions but we eventually found it – cost 15.50 Euro), we road into Mulhouse to visit the Schlumpf Collection of Automobiles in the National Museum. For around 25 Euros (plus a 10 Euro deposit for a locker for our helmets) we spent 5 hours or so in the fascinating place. The collection included some of the first automobiles ever produced and featured a huge assembly of Bugatti vehicles from the first to the 2011 Veyron…..which can go from 0 to 100km in 2.5 sec and from 100km to 0 in 2.3sec. It has a top speed of 431km per hour.